An innovative independent Publisher of Genre Fiction and New Pulp, Pro Se Productions releases the debut story in Author Alexander S. Brown’s series entry into the Pro Se Single Shot Signature line of digital singles. Experience every scare, prank, and trick of Halloween in a whole new, even terrifying way in Brown’s THE NIGHT THE JACK O’LANTERN WENT OUT. Halloween. A holiday that inspires memories, excitement, and a little bit of fear in everyone. A single day where all the ghosts and ghoulies come out to play and sometimes its hard to tell which of the creepy crawlies are human and which ones truly rise from beyond seeking unsuspecting souls. Author Alexander S. Brown explores all the wonderfully terrifying possibilities Halloween has to offer in his Pro Se Single Shot Signature Series- THE NIGHT THE JACK O’LANTERN WENT OUT! Each month Brown delivers a new tale of terror laced with just enough nostalgia that makes us all hope Halloween comes sooner…and stays far enough away that the monsters don’t get us! Brown’s first story, THE NIGHT THE JACK O’ LANTERN WENT OUT, tells the tale of a Halloween prankster, an old legend, and what happens when the two clash when night falls one October 31st. 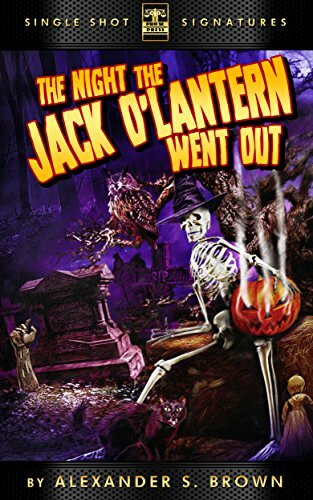 THE NIGHT THE JACK O’ LANTERN WENT OUT by Alexander S. Brown, with cover and logo design by Jeff Hayes, utilizing the Pro Se Logo created by Sean E. Ali, and Ebook design and formatting by Russ Anderson is available for only 99 cents at Amazon, Barnes & Noble, www.smashwords.com, and other ebook outlets.